November already: the heat is on, the leaves have fallen, and I saw the first snowflakes yesterday. Fortunately, the Cornell orchard still has plenty of fruit. As I was browsing through Katrina’s posts on Baking and Boy for November’s Secret Recipe Club assignment, I kept gravitating to the fruit recipes (despite my longing looks at all the delightful Christmas cookies Katrina has made over the years). Should I make one of those lovely crisps? Should I try a tart? Or– even better– take fruit and dip it in chocolate. These little balls of apple were adorable, although I don’t have a melon baller, so I just used large chunks instead. I make these just for me a couple of times, and then makes dozens and dozens for a department gathering (seriously, we stopped counting at 68). 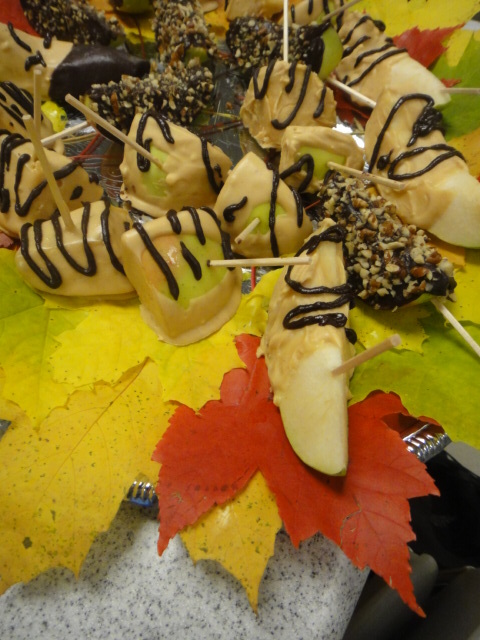 Shown in the picture are a few variations: apples with dark chocolate and pecans, pears dipped half in white chocolate-PB and half in chocolate, and both dipped in white chocolate-PB with chocolate drizzle. They were so popular that I only ended up bringing home five pieces. They did stay in ok shape overnight, but the chocolate fell off more easily the next day, so I’d say try to make them the same day if possible. Melt the white chocolate and stir in the peanut butter (or melt the dark chocolate and stir in the butter). Stick a toothpick into each chunk of apple. 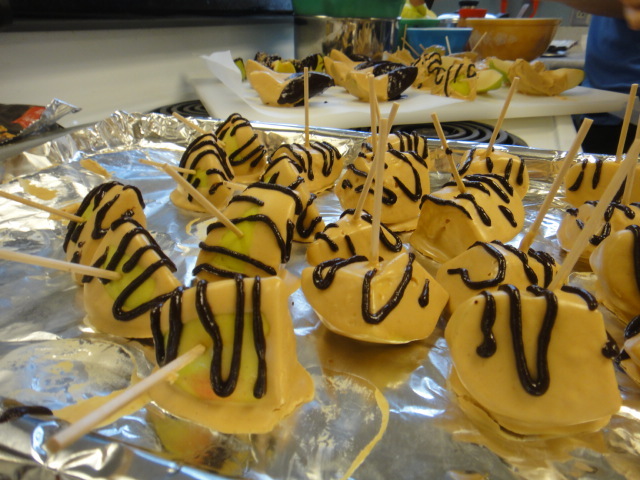 Dip the chunks of apple into whichever mixture you prefer or apply chocolate with a spatula or spoon. Top or decorate as desired, and place in the fridge until the chocolate has set. If the chocolate seizes (clumps up), add a little more chocolate and some cream. Reheat, and it should smooth back out. *The peanut butter chips I found had partially hydrogenated (aka trans) fat as a major ingredient, so I dug around for an alternative. This worked very well for me, but another alternate is pure cocoa butter, a sweetener of their choice, and peanut butter. Those look so pretty. I’d take those fruit bites over other sweets any day. Yum! Deliciousness. Reminds me to try those again. My boys would love them. Thanks for making something from my blog. I’m glad you liked them. yum! love these- great SRC pick! Your post sent me straight to the pantry for Nutella and apples, a pre-cooking snack because I just couldn’t wait to melt the official ingredients. What tempting little bites. Oh man, my girls would just love these. What a great, fun snack! And a great way to get your fruit servings in. Yes, there were a handful of 3 to 6 year olds waiting to pounce as I was setting them out! The toothpicks are important, according to some little ones (not acceptable to not get a toothpick in your apple), it’s not just the chocolate and peanut butter. Such a great pic, love these kinda guilt free sweet treats. what an amazing little snack! i love apples and pb or chocolate. but together? wow! great src pick! check out my pumpkin graham muffins if you have a chance. Sorry, Sarah, I’m really not much of a baker these days (and some months SRC members produce a lot of baked goods!). I’m glad you liked these, and thanks for commenting.